Three years ago, the Kremlin decided to power up its propaganda efforts and created Sputnik News, a younger brother to the globally-known TV channel RT. The new multimedia news agency opened offices around the world, including in the three Baltic capitals. Meanwhile, another news portal for the region’s sizeable Russian-speaking minority appeared. It was named Baltnews and, unlike Sputnik, tried to keep its connections to Russia secret. In truth, both outlets are brothers. As part of Re:Baltica’s ongoing investigation into propaganda sites, especially those with a pro-Kremlin slant, reporters found documents that link Baltnews to the Russian-state multimedia conglomerate Rossiya Segodnya. This fact is obscured by a chain of owners, seemingly designed to make it appear as though Baltnews arose from local organizations. 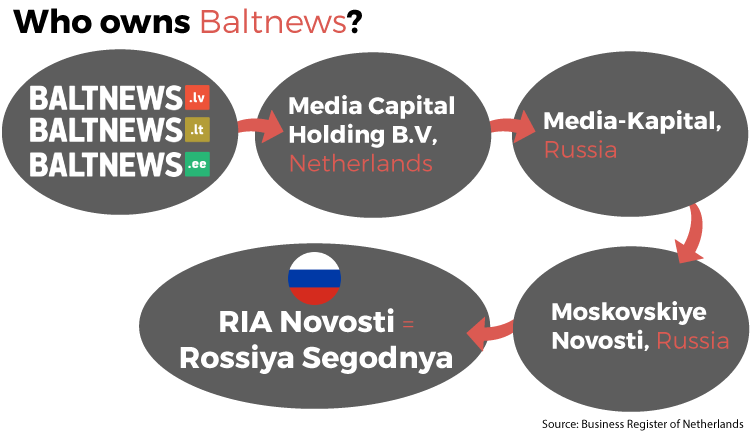 Baltnews, which describes itself as an “informative analytical news portal,” has teams in the three Baltic countries: Estonia, Latvia and Lithuania. The news portals publish local news in Russian and also reprint news from Russia; they display little to no advertising. The owners are registered in the Netherlands, he said, although he wouldn’t name them, telling reporters to “look them up on the Internet.” He also added the owners had a very special business “know-how”, but said that the Baltnews team is not so stupid as to share details about it with the world. The three news portals’ web addresses are registered to the company Media Capital Holding B.V. 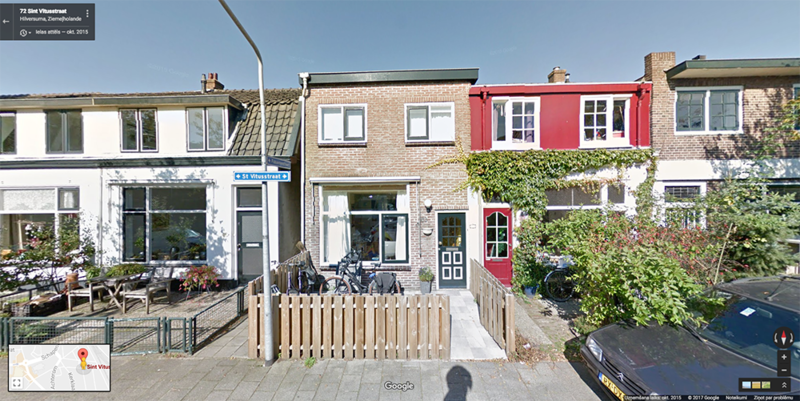 It is located in a tiny two-story red-brick building in small town of Hilversum, Netherlands. Real estate website identifies it as a residential flat. The company was registered in 2013 with core capital of 1 EUR. E-mails sent to an e-mail address indicated in the domain registry and to the press service of Rossiya Segodnya went unanswered. Media Capital’s company’s sole owner is a Russian-registered company, Media-Kapital, which is owned by the Russian newspaper Moskovskiye Novosti, which is in turn owned by the state-owned news service RIA Novosti. RIA Novosti is now part of the Rossiya Segodnya state-owned media company, which includes the Sputnik News. The link was first noticed by the Estonian security service (KAPO), but it was not elaborated. 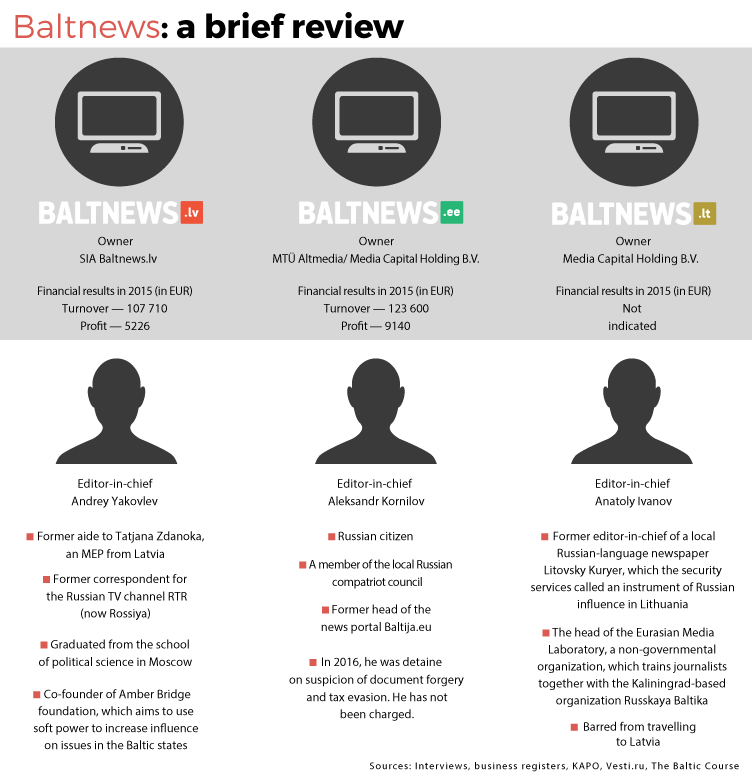 In its 2014 annual report, the security service said one of the key forces behind Baltnews is Vladimir Lepekhin, a Russian resident and the director of the Eurasian Economic Community Institute. 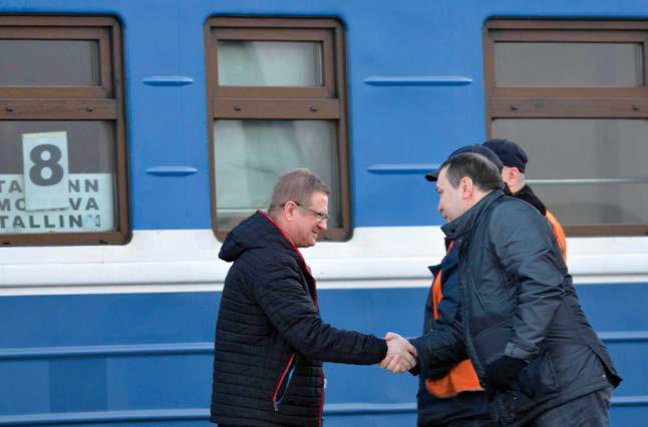 Lepekhin “actively participated in the Russian operations on increasing influence in neighboring countries and he visited Estonia in spring 2014,” said the report. In August 2016, Kornilov was detained for a few days by the Estonian police under suspicion of forging documents and tax evasion. 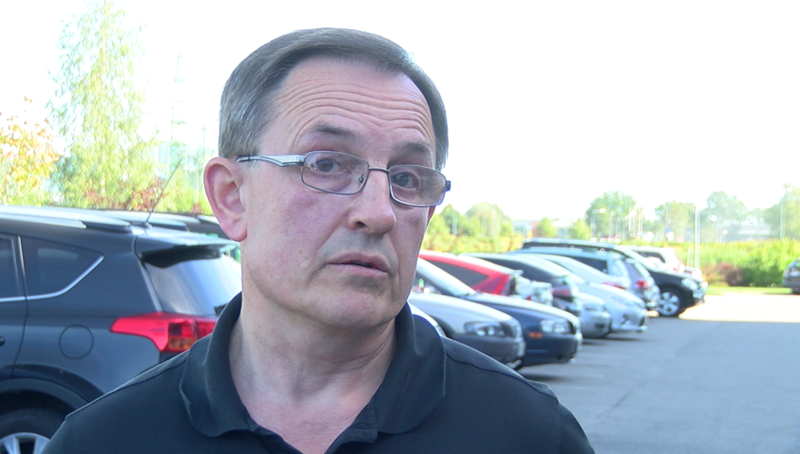 The police believe he was using payments for allegedly fraudulent business deals, withdrawing almost €50,000 in cash from an account belonging to the non-governmental organization (NGO) Altmedia, which is listed as an owner of the Estonian Baltnews. No charges have been filed. 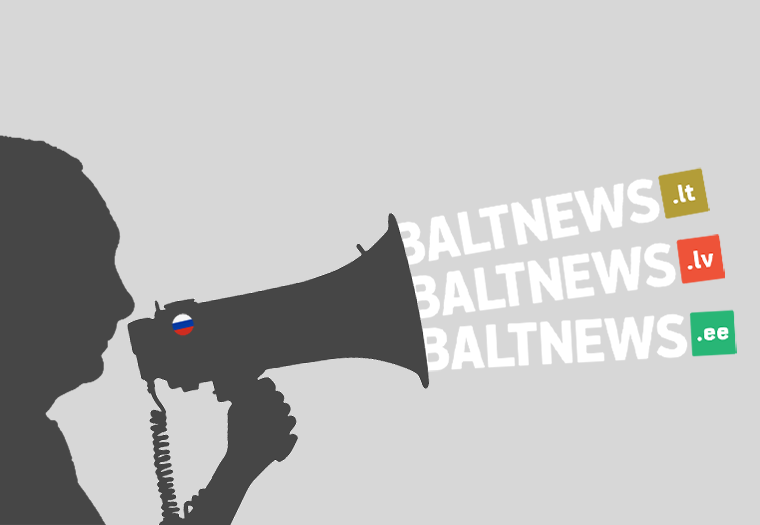 Altmedia, a non-government organization (NGO) listed as an owner of the Estonian Baltnews, is one of the organizations funded by Russian “soft power” NGOs to defend the interests of ethnic Russians abroad, according to Re:Baltica’s earlier investigations. The companies that are listed as owning Baltnews in the three Baltic states reported an annual turnover of between €100,000-120,000. The Dutch-registered Media Capital Holding B.V. doesn’t list its turnover in its annual reports. Ivanov, the head of Lithuanian Baltnews, was irritated by the idea that his publication is a mouthpiece for the Kremlin view. “We publish news; it cannot be propaganda,” he said. The site contains reprints of news items from Inosmi, a RIA Novosti and Rossiya Segodnya site dedicated to translating Western journalism into Russian. And in truth, Baltnews headlines are more moderate than those of the openly pro-Kremlin local news media. In January 2017, Baltnews published an op-ed piece titled NATO to the Baltic states: You don’t want to fight the Russians? We’ll force you to. It was written by Galina Sapozhnikova, a colorful character who officially is a journalist at Russia’s newspaper, Komsomolskaya Pravda. The piece echoes a familiar mantra of Russian foreign policy: it is better for the Baltic states to be friendly to Russia because the West does not care about them. Sapozhnikova also leads two discussion clubs, called Impressum and Format A-3, which host discussions with Russians guests in areas which Russia considers within its sphere of interests, such as the Baltic states, Moldova, and Ukraine, including Crimean. “The events organised by Impressum are characterized by the absence of any free exchange of ideas and, rather, the dissemination of the core messages of Russia’s influence operations,” says the Estonian Internal Security Service report. In her op-ed, Sapozhnikova included at least four statements which were erroneous or even fake. It’s taken out of context and creates the impression that it could happen any day now. In truth, the Estonian government decided it could confiscate cars and farming equipment when and if the military enters a state of increased readiness. A veteran of the Soviet war in Afghanistan in the late 1980s, Kransopyonov, who had worked for the Latvian Railways for 20 years, took photos of NATO military equipment being transported by Latvian railroad, not a single selfie. The photo was sent to the men with whom he served in Afghanistan. The Latvian security service detained him in November 2016 and the court extended the detention while the investigation is ongoing. In this case, drunken British soldiers were in a brawl at a fast food restaurant and beat up a Latvian man. However, at no point was it said that they had mistaken him for a Russian or that it was the reason for the brawl. The Daily Telegraph first reported on this. Later, the news appeared in The Sun and Daily Mirror. On one occasion in 2015, NATO troops marched through the small town. There was no street fighting, said a spokesman for the Estonian armed forces, Lt. Roland Murof. Asked to comment on the specific facts in a phone interview, Sapozhnikova said, “I used the information that was available to me.” She didn’t want to elaborate and hung up the phone. Sapozhnikova isn’t the only openly pro-Russian author at Baltnews. Baltnews.lv, the Latvian news portal, regularly publishes articles written by the Latvian National Bolshevik Vladimir Linderman, a radical, who has founded many organizations to promote his ideas. Another regular is Andrei Solopenko. In 2015, Solopenko was refused an accreditation at the European Union Eastern Partnership summit in Riga, which he hoped to attend as a representative of the magazine Baltiysky Mir, funded by the Russian Foreign Ministry to target Russian-speaking compatriots outside of Russia. Solopenko, along with Estonia’s Russian activist Maksim Reva, participated as “independent observers” in the internationally unrecognized referendum in Crimea in 2014. The two of them, together with Baltiysky Mir editor-in-chief Dmitry Kondrashov, founded a Moscow-based NGO called International Foundation Helsinki Plus. Little is known about the foundation’s activities. The organization’s title appears to link to the 1975 Helsinki Accord of what is now the Organization for Security and Cooperation in Europe (OSCE). Following the Crimean referendum, Reva said that the referendum was flawless. He added the organization was preparing a report for the United Nations and OSCE. Even though the announcement was published throughout Russian media, the report cannot be found on sites of either organizations. In September 2016, the NGO was liquidated. According to data from similarweb.com, Baltnews’ audience is rather small. In the last six months, the Latvian site’s audience is about one-thirtieth the size of that for Latvia’s largest Russian news portal, rus.delfi.lv. However, Baltnews’s goals may be to flood the internet with Russia-friendly content which then continues spreading outwards like a spider web. The article by Sapozhnikova about exaggerated and unfounded Baltic fears of a war with Russia was republished by 14 other web sites. In Lithuania, however, the security services are of a different opinion. Sapozhnikova’s book, Who Betrayed Whom: How the Soviet Union was Killed and What Happened to Those Who Tried to Defend It, was translated into Lithuanian. In March 2017, it was taken out of circulation. With a print run of only 500 copies, the book calls Lithuania’s independence from the USSR in 1991 the first “color revolution,” the usual Russian propaganda term for uprisings against pro-Russian leaders in its neighboring countries which slip away from its embrace. The official reason for pulling the book off bookshelves was its denial of the Soviet occupation.